The phenomenon of digitalisation and networking of the entire value added chain – Industry 4.0 – is also gaining importance in the textile industry. Following this trend, H. Stoll, a long-established manufacturer of flat knitting machines based in Reutlingen, Germany, will present an innovative software tool for networking of large machine parks at the ITMA textile machinery show. Rummaging through any closet is certain to turn up some kind of knitwear: pullovers for winter, leggings for spring, summer dresses or a vest for autumn. Meanwhile, knitting processes are also used for the manufacture of technical textiles, such as seat covers, industrial filters and medical bandages. But diversity in the manufacturing process and short-lived fashion trends – instead of two collections per year, as in the past, it is now not unusual to have ten or more – are increasingly putting pressure on the knitting mills: the intervals at which their machine parks have to be reprogrammed and reconfigured are becoming even shorter. In the future, this will be performed by the “Production Planning System” (PPS) from Stoll. This software is the first system to completely network the production control of a knitting machine park; it collects various production, machine and process data at a central control station. From there, it is possible to individually monitor, control and configure each machine with a separate knitting job order, such as the manufacture of a pullover, skirt or seat cover. The system also provides information with details on which order is currently being knitted and when it is expected to be completed. According to CEO Andreas Schellhammer, the goal of the long-established machine manufacturer – established in 1873 and an active member of the VDMA Textile Machinery Association – in developing the PPS was to provide knitting mills with a tool that completely visualises the digital chain from the knitting job order through to completion of the product, in order to increase capacities, productivity and therefore profitability. According to information provided by the company, the pilot phase has shown that the PPS can boost productivity by around 10 percent. The reason: networking of the machines not only allows knitting mills to process orders faster and more frequently, but also to profitably manufacture small batch sizes, as a result of simplification of the machine operation. The phenomenon of digitalisation and networking of the entire value chain – Industry 4.0 – is also gaining importance in the textile industry. H. Stoll AG & Co. KG, a long-established manufacturer of flat knitting machines based in Reutlingen, Germany, will present an innovative software tool for networking of machine parks with up to a thousand machines at the ITMA textile machinery show in mid-November. CEO Andreas Schellhammer talks about digitalisation as a challenge and opportunity for the long-established float knitting machine manufacturer, whose machines are increasingly being used for the production of technical textiles. In the run-up to ITMA in Milan, Nicolai Strauch, press officer VDMA Textile Machinery, spoke to Andreas Schellhammer. Strauch: Your company, which is an active member of the VDMA Textile Machinery Association, is currently drawing attention with an innovative software tool for networking of flat knitting machines. This is in response to the trend of Industry 4.0. Why? Schellhammer: Our multi-functional control center, the “Production Planning System” (PPS), is the answer to the question of how we can offer our customers added value within the framework of Industry 4.0. The fact is: Networking of the individual machines in a machine park and digitalisation of the production chain is advancing rapidly and is offering significant potential. We, as a long-established machine builder, are taking these topics very seriously and have therefore increased the number of IT and software specialists. Strauch: What is the main business activity of the Stoll company? Schellhammer: Our core business is the manufacture of flat knitting machines, which meanwhile are delivered to more than 70 countries around the world. Knitting mills – from large-scale factories in Asia to premium manufacturers in Europe – use them to produce pullovers, vests, skirts and dresses, as well as seat covers, bandages for medical use and even filters for industrial applications. In addition to the manufacture and sale of flat knitting machines, we also offer a diverse range of services, including application development, in order to assist and support the customer making best use of his machines. Strauch: You mention seat covers, medical bandages and industrial filters, which are considered technical textiles. Is this a trend in flat knitting? Schellhammer: The field of technical textiles is gaining importance in flat knitting. For example, the integration of extremely thin metallic threads in lighting or heating functions is becoming more widespread. Since the Stoll company as a competent solution provider is growing in this area, this segment offers extraordinary potential. Strauch: When Stoll was established in 1873, Bismarck was still the Chancellor of Germany. Is it even possible to adapt knitting, as one of the basic textile technologies, to the requirements of the 21st century? Schellhammer: We developed the world’s first “Links-Links”-flat knitting machine in 1893, which revolutionised the textile machinery market at that time. Trends and requirements related to the production of our customers have always been reflected in the different generations of flat knitting machines - which has not changed until today. Nowadays knitting mills have to become much more responsive, because the fashion companies have shortened the collection cycles enormously. While stores in the past presented two collections per year, today it is not unusual to have ten or more. Consequently knitting mills also have to adapt their production infrastructure very quickly to new collections. This also means a challenge for us as machine manufacturer: we have to make sure that the flat knitting technology keeps up with those new requirements, providing state-of-the-art industrial structures to allow our customers to manufacture competitively. Dipl.-Ing. 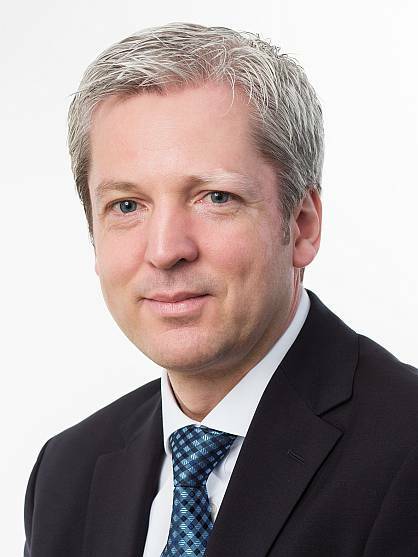 Andreas Schellhammer (47) joined the company H. Stoll AG & Co. KG in 2013 as a member of the general management responsible for development and production. Since July 2015 Mr. Schellhammer has been the Chief Executive Officer (CEO). Having started his career as a qualified mechanical engineer in the automotive industry he has a long-term experience regarding product development and production processes. Strauch: Back to the PPS: What are the specific advantages for knitting mills? Schellhammer: The primary purpose of the software is to increase efficiency in production. Knitting mills are now able to respond to the increased requirements of the market in a much better and faster way. An example: every flat knitting machine requires a special program for the knitted product provided by the job order. Most knitting mills have hundreds of flat knitting machines in their production halls which give an idea of how much time and effort goes into the programming of job orders. Strauch: Is the software already in use? Schellhammer: Since August, the pilot phase is running at selected customer locations worldwide. All of these customers have meanwhile signalized that they consider to purchase the software. This shows that it is important even for long-established machine manufacturers to recognise technology trends and to respond accordingly. A networked machine park is very important in times of increasingly individualised production – even batch size 1 production, in which a single product is manufactured based on individual customer requirements, will soon be profitable. With the help of our new software, knitting mills can efficiently process a big variety of large and small orders simultaneously, which in the past was almost impossible due to the enormous cost and effort involved. With our ”Production Planning System”, a knitting mill with for example a total of 500 machines can simultaneously knit pullovers, leggings and skirts on 400 machines, car seat covers and medical bandages on 80 machines and small orders on the remaining 20 machines. For such an individualized production currently each flat knitting machine has to be individually programmed with the specific job order and restarted locally. Many knitting mills prefer not to produce small batch sizes, simply because of the expense. As a result of networking, knitting mills can then develop new product fields and orders, which will give an enormous boost to their capacity, productivity and therefore their profitability. Based on our research up to now we assume that our PPS can increase productivity by around 10 percent. Strauch: Will you present the new control center at ITMA? Schellhammer: At the ITMA Milan we will present the PPS as a serial product to the public for the first time. Visitors will be able to experience all the functions of the control station, which can also be operated via smartphone or tablet computer.